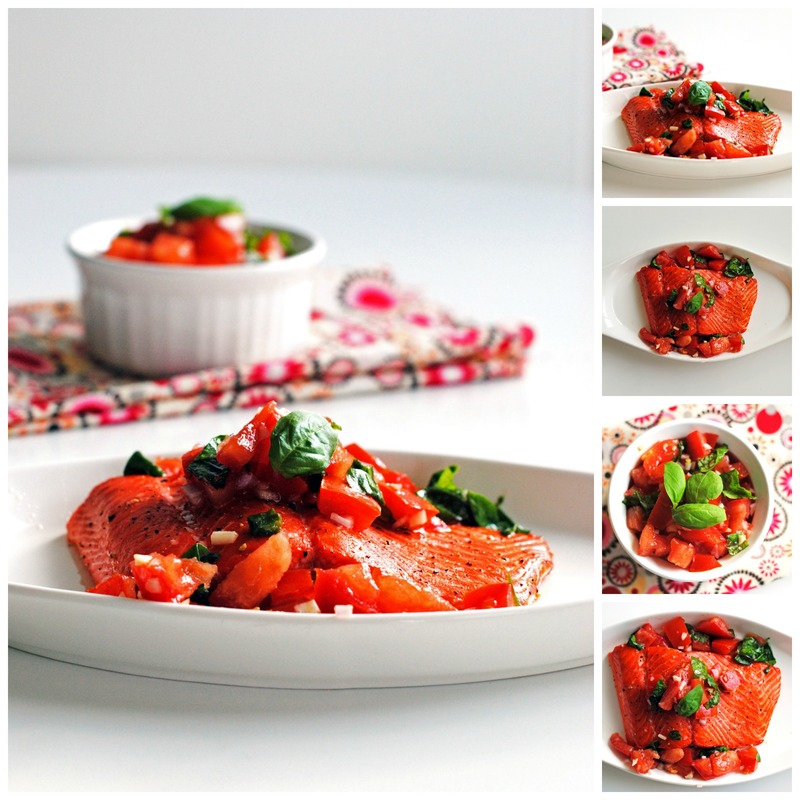 Salmon is one of my favorite types of fish to make at home. 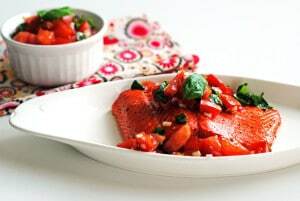 For this recipe, you’ll need salmon fillets with skin on and about 1 1/2 inches thick. We’ll preheat the oven to 500 degrees. Then, we’ll turn down the heat to 275 degrees just before placing the fish in the oven. This initial blast of heat will firm the exterior of the salmon and render some excess fat, while the oven temperature slowly drops, the fish will cook gently and stay moist at the same time. 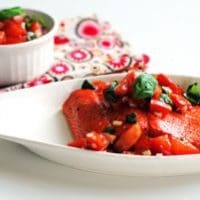 Pair an easy relish of fresh tomatoes on top and enjoy. Combine all ingredients for the relish in a medium bowl and season with salt and pepper and set aside. Adjust your oven rack to the lowest position, and place a rimmed baking sheet lined with foil (for easy clean up) on the rack, and heat the oven to 500 degrees. Make 4 or 5 shallow slashes about an inch apart along the skin side of each piece of salmon, being careful not to cut into the flesh. Pat the salmon dry with paper towels. Rub fillets with oil and season with salt and pepper. Reduce the oven temperature to 275 degrees and remove the baking sheet from the oven. Carefully place the salmon, skin side down on the baking sheet. Roast for 9 to 13 minutes or until the thickest part of the fillets register 125 degrees. Transfer fillets to serving plates and top with relish.